Register your team for our fishing invitational. Please complete the form below to submit your application for invitation to the tournament. By accepting this nomination I agree to abide by all rules and codes set forth by the Association and understand that failure to do so could result in the disqualification of my entry to all further Fourchon Oilman's Association Inc.'s invitational events. All participants need to be over 21 years of age. I also understand that my membership does not immediately qualify me for all future Fourchon Oilman's Fishing Tournament events as they are determined by the board and are by Invitation only. Parking will be available for everyone at designated areas. Signs will be posted. Also there will be a drop off area in front of the tent for guest. Will begin at 1pm on the Thursday of the event. We encourage you to check in your teams early to avoid long lines. . Please be able to indicate your 6 anglers & 4 guests so name badges can be made accordingly. If for some reason you cannot check in your team on Thursday, registration will be open on both Friday & Saturday. NOTE: Everyone, anglers, guest, sponsors and volunteers, will need proper credentials to enter the tent. Security will be checking everyone at the door each night. Credentials will be given out when you come to register/check in your team. If you do not have it when you enter, you will be asked to leave. The Board members of the FOA will host a Captains Meeting on Thursday evening about 7pm. An announcement will be made at that time, directing you where to meet. Meeting should last no more than 20-30 minutes. It is MANDATORY THAT ONE MEMBER FROM EACH TEAM attend. Attire should be neat, clean and presentable. Shorts, jeans, t-shirts, fishing shirts & pants are ok. Shoes are a must for everyone. NO bathing suits will be allowed. Fishing will begin no earlier than ½ hour before sunrise on Friday of the tournament and ends on Saturday @ 6pm, when scales close. You must be in line to check in & weigh your catch by a Wildlife & Fisheries’ weigh-master person before 6pm to qualify for awards & prizes. On the East side of the ‘No Wake Sign” in the Flotation Canal just west of the weigh-in station (in visual site), if arriving by water. No outside food and drinks will be allowed under the tent or surrounding areas where the rodeo event is being held. Our designated 1st-class catering provider will provide all catering. You will be treated to the finest and freshest local foods, seafood and delicacies that southern Louisiana has to offer. Please note that there will be NO smoking inside the tented area. IF you must smoke, please step outside into the designated courtyard. If any first aid treatment or medical attention is needed, please contact a Board or staff member who will be able to direct you to the medical attendant. Lafourche Parish deputies and Harbor Patrol will be on site if any issues come up that need attention. Remember that credentials will be checked at the door and no one will be allowed to enter for any reason without them. Should something occur that needs security assistance, please contact a Board or staff member who will be able to direct you to a Security officer. Each night, badge-numbers will be drawn for door prizes. This year, the FOA has decided that for each fishing team, each of the 6 Anglers & the 4 non-competing guest, will be eligible for the regular nightly door prizes. Only 6 Anglers are eligible for the Grand Prizes Thursday, Friday and Saturday. The list of winners will be displayed on a scrolling board throughout the night. For Thursday & Friday night, if an angler’s number is pulled and he or she is not present, the door prize will be held until 7:45pm Saturday for claiming. Any door prize not claimed at that point will will be reserved by FOA for following year’s door prizes. For the Grand Prize drawing on each night, the person drawn must be present to claim the prize. He must then show his Rodeo badge and picture ID for confirmation to claim the prize. 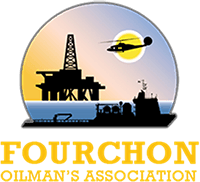 On behalf of the Fourchon Oilman’s Association Board, we THANK YOU for your participation and continued support! We wish everyone good luck fishing! Any Person that is directly employed by a drilling, exploration, production, or service company to the oilfield industry, or their direct family member, (wife, son, daughter) is eligible to participate. All Team Captains must be directly employed by a drilling, exploration, production, or service company of the oilfield industry. *Guests do not have to meet criteria. Safe boating practices must be in effect at all times. Drunkenness on the part of any contestant will not be tolerated. Please observe Coast Guard regulations concerning boat capacities. All TEAM Captains must be present. Anglers fishing from Atlantic HMS permitted vessels and participating in Atlantic billfish tournaments must use only non-offset circle hooks when deploying natural bait or natural bait/artificial lure combinations. Billfish tournament anglers may only deploy “J”-hooks with the use of artificial lures. Fishing will begin on Friday 1/2 hour before sunrise and close on Saturday at 6:00pm. The rodeo weigh-master is the supreme judge and all decisions are final. He/She decides how many fish an angler can weigh. Trophies and prizes will be given to 1st-3rd place, trophies will be given to 4th and 5th. Points will be accumulated by the 6 anglers per fishing team. No company will combine multiple teams for points. For Tarpon Catch & Release: Places will be decided by most points. 100-Points for each valid catch. For a catch to be valid, anglers are required to video/picture the catch with wristband and (at a minimum) touch the leader within 3-feet of fish. Tie-breakers will be decided by earliest first-tarpon caught. Points will be accumulated by the 6 anglers per fishing team. No company can combine multiple teams for points. This is considered a boat award for blue water division only. This will be given to the angler who has the most combined points in all divisions. Tiebreaker will be heaviest fish weighed. This will be given to the team who has the most combined points in all divisions. No team will be able to combine multiple teams for this award. Tiebreaker will be heaviest fish weighed.